GREENPOINT — Sales opened Thursday at the neighborhood's first condo skyscraper — a 40-story waterfront tower featuring luxe amenities like a BBQ beach, hammock grove, speakeasy and basketball court — with one-bedroom apartments going for nearly $1 million. The Greenpoint, at 21 India St., is slated for completion by summer 2018 and will followed soon after by a series of towering apartment buildings, as the residential boom along the North Brooklyn waterfront moves north. One-bedroom apartments in the building start at $989,000, with two-bedrooms starting at $1,515,000 and three-bedrooms starting at $2,160,000. A spokeswoman for the development — built by Mack Real Estate Group and Palin Enterprises, along with Urban Development Partners — would not say the upper end of the price point for units in the building. The project includes 95 condos starting on the 28th floor, as well as 508 rental apartments on lower floors and in adjoining, lower-rise buildings — 140 of which will be subsidized for moderate- and low-income New Yorkers. It wasn't immediately clear how much the subsidized or market-rate apartments will rent for. ​The project also includes a 29,000 square foot public park, and celebrity chef Marcus Samuelsson of Harlem's Red Rooster is slated to open a massive restaurant in the building. The Greenpoint-Williamsburg waterfront was rezoned under former Mayor Michael Bloomberg in 2005, allowing for an explosion of mostly luxury housing development along the North Brooklyn waterfront. 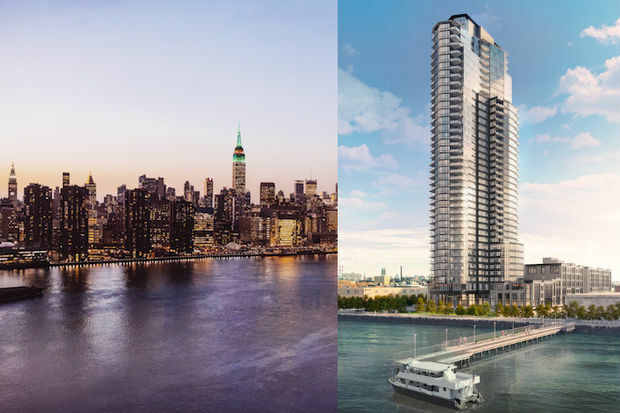 The development began further south in Williamsburg, where buildings like The Edge and Northside Piers have drawn in thousands of new residents. Projects like Greenpoint Landing, which is under construction a few blocks north of The Greenpoint, are expected to pull thousands more residents into Greenpoint in the coming years.